This week, we continue to celebrate our latest video on social employee advocacy. Check out our new video below, read ahead for cool octopus facts, and don’t forget to nominate your favorite social employees for our #OctoLeader Award! 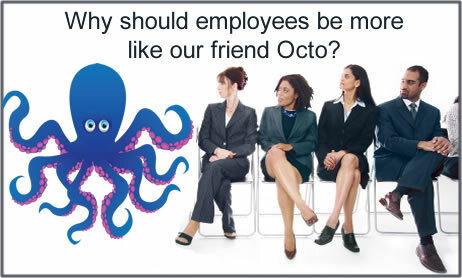 Here at Blue Focus Marketing, we’re big fans of octopuses. After all, they’re a lot like social employee advocates: engaging, creative problem-solvers who can adapt and thrive in just about any environment. Last week, we showed some fun videos demonstrating the diverse range of skills and abilities octopuses possess. This week, we’ll explore some other little-known octopus facts and why they matter for your team of social employee advocates. There you have it. While “octopi” is right out, “octopodes” is also technically acceptable—but only if you speak Greek. Here’s how it applies to employee advocacy: Speak your audience’s language. The second a stakeholder says, “It’s all Greek to me,” you’ve lost them. Listen to your audience, learn their needs and the words they use to describe them, and engage with them on their terms. Social employee advocacy is all about communities of shared interest. Sure, you want your target audience to know who you are and what you’re selling, but you don’t want to be pushy about it. Instead, you want to blend in with your environment, making your presence known at appropriate moments, but otherwise letting your communities carry on with their day-to-day business. As the video points out, a lot of suckers each sending back information is a lot of data to process. So much so that the octopus’s central brain actually delegates some of that processing to the arms themselves. This is a lot like a good social employee advocacy program. Sure, management has to make the big decisions, but the individual employees are out on the front lines. They have the most access to real-time info, and therefore they should be empowered to make decisions on their own. That concludes week 2 of our octopus celebration. Do you know any other fun octopus facts? Why not share them in the comments!